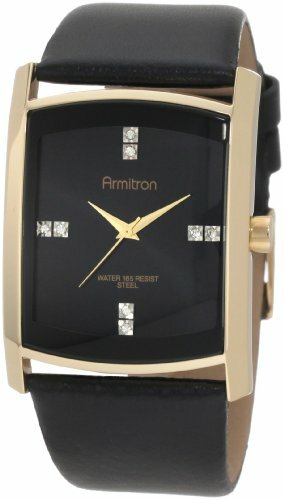 Shimmering crystals and sleek gold-tone accents define the Armitron Men's Swarovski Crystal Accented Gold-Tone Black Leather Strap Watch. With a thick, black edge framing the rectangular, black dial, this stylish timepiece features an elegant, gold-tone stainless steel case that extends to secure the smooth, black leather band with matching gold-tone buckle clasp. The elongated dial offers a streamlined design with stunning, double-set crystals at three, six, nine, and 12 o'clock. Gold-tone hour and minute hands and a sweep second hand track the time, and this fashionable timepiece is water resistant to 165 feet (50 meters). Relying on precision Japanese quartz movement, this classy watch is dependable and adds a level of sophistication to the modern man's wardrobe.